A polar orbit is one in which a satellite passes above or nearly above both poles of the body being orbited (usually a planet such as the Earth, but possibly another body such as the Moon or Sun) on each revolution. It therefore has an inclination of (or very close to) 90 degrees to the body's equator. A satellite in a polar orbit will pass over the equator at a different longitude on each of its orbits. Polar orbits are often used for earth-mapping, earth observation, capturing the earth as time passes from one point, reconnaissance satellites, as well as for some weather satellites. The Iridium satellite constellation also uses a polar orbit to provide telecommunications services. The disadvantage to this orbit is that no one spot on the Earth's surface can be sensed continuously from a satellite in a polar orbit. Near-polar orbiting satellites commonly choose a Sun-synchronous orbit, meaning that each successive orbital pass occurs at the same local time of day. This can be particularly important for applications such as remote sensing atmospheric temperature, where the most important thing to see may well be changes over time which are not aliased onto changes in local time. To keep the same local time on a given pass, the time period of the orbit must be kept as short as possible, this is achieved by keeping the orbit lower around Earth. However, very low orbits of a few hundred kilometers rapidly decay due to drag from the atmosphere. Commonly used altitudes are between 700 and 800 km, producing an orbital period of about 100 minutes. The half-orbit on the Sun side then takes only 50 minutes, during which local time of day does not vary greatly. 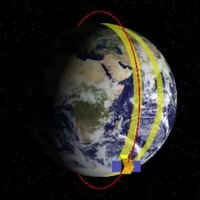 To retain the Sun-synchronous orbit as Earth revolves around the Sun during the year, the orbit of the satellite must precess at the same rate, which is not possible if the satellite were to pass directly over the pole. Because of Earth's equatorial bulge, an orbit inclined at a slight angle is subject to a torque, which causes precession. An angle of about 8° from the pole produces the desired precession in a 100-minute orbit. ^ a b Stern, David P. (2001-11-25). "Polar Orbiting Satellites". Retrieved 2009-01-21.